Michigan State toppled Wisconsin in Madison, while Purdue's conference-best 8-game winning streak was snapped by the Terps in College Park. Meanwhile, Michigan went out to Happy Valley and got stunned by previously 1-11 Penn State. The end result of all that? Things are bunching up at the top of the league standings. Michigan and Michigan State are tied atop the league at 11-3, while Purdue is just a half-game back at 10-3. Maryland is lurking just a game back at 10-4, while Wisconsin fell to two games back of first at 9-5. 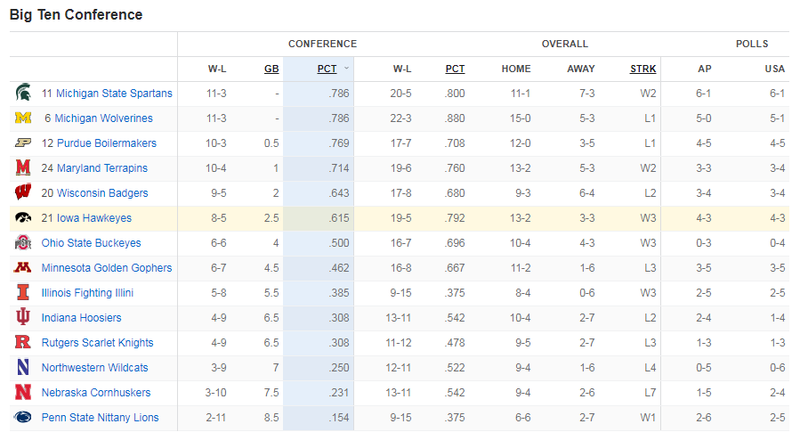 And then there's our beloved Iowa Hawkeyes, up to sixth place in the league now. They're 2.5 games out of first -- and just 1.5 games out of fourth place. A top-four finish in the Big Ten means a double-bye in the Big Ten Tournament, which could get Iowa one step closer to playing on Saturday at the Big Ten Tournament for the first time in Fran's tenure. I think a Big Ten title is a bridge too far -- Iowa is still 2.5 games back of Michigan State and two games back of Purdue, both of whom hold head-to-head tiebreakers against Iowa. They're also 2.5 games back of Michigan, but Iowa at least has a head-to-head tiebreaker advantage there. They currently lose the head-to-head tiebreaker to Wisconsin as well, although any title-winning scenario for Iowa has to include a win over the Badgers in Madison next month, which would nullify that tiebreaker edge for Wisconsin. Iowa's Big Ten title aspirations involve winning out (tough!) and getting help in the form of additional losses from Sparty, Purdue, and Michigan (also tough). But what about a top-four finish? They're only 1.5 games out of fourth right now -- and they play the current fourth-place team (Maryland) in Iowa City next week. With a win there, Iowa could surpass the Terps given that Iowa's next game is against Rutgers and Maryland's next game is at Michigan. Two wins for Iowa would make them 10-5, while two losses for Maryland would make them 10-6. Of course, there's also the Wisconsin problem to consider -- Iowa will likely need to beat Wisconsin in Madison to get (or stay) ahead of them in the league standings and Madison is where dreams (and enjoyable basketball) usually go to die. Michigan and Michigan State still have to play each other home and away, which means more losses are coming to one or both of them. Outside of those intra-state showdowns, Michigan State's schedule looks pretty friendly -- home games against Rutgers and a rapidly-fading Nebraska look inviting. Ohio State and Indiana are both bubble teams fighting for their tournament lives, but should be beatable if Good Sparty shows up in those games. Michigan has the most challenging slate remaining among the Big Ten's top teams. In addition to the intra-state slugfests with Sparty, they also have to play Maryland home and away and have a tricky road trip to Minnesota to face a Gopher team that could use a big win to shore up its own NCAA Tournament credentials. If Michigan wins the Big Ten regular season title, they'll definitely have earned it. Purdue, by contrast, has the friendliest slate remaining among the Big Ten's best squads. Only one of their remaining seven games is against a team currently in the top half of the Big Ten standings -- Ohio State, who's 6-6 and 7th in the league right now. And the Boilermakers get that game at home. Their other six games are against teams in the bottom half of the league standings -- one against everyone but Rutgers. Purdue is only a half-game back of the leaders now and if they take care of business while one or both of the Michigan teams stumble, there could easily be some Big Ten champions in West Lafayette. Maryland's schedule suggests it could have a hard time holding onto its current Top-4 position. Those games against Michigan are going to be difficult, as should the game at Iowa. Penn State is a sneaky-tough road environment to win at, as Michigan found out last night and Iowa nearly found out earlier this year. And their other two games are home games against Ohio State and Minnesota, two teams who will be desperate for a notable road win. Maryland's slippage is likely to be Wisconsin's gain in the Top 4 race. The Badgers have only two games left against teams in the top half of the league standings -- Iowa and Ohio State. Illinois has been frisky lately (winners of three in a row), but they'll be hard-pressed to extend that winning streak in Madison. Penn State is also frisky, but less so away from home than in Happy Valley. And road games at Northwestern and Indiana don't look that daunting. In all honesty, Iowa's path to a Top 4 finish in the Big Ten may not be all that different than their only possible path to a Big Ten title: win out and get some help. Iowa wouldn't actually need help if they did win out -- they'd be 15-5 and Maryland and Wisconsin would be no better than 15-5 and 14-6, respectively -- but... it's also a little hard to envision this Iowa team winning out. Three of the final four games are on the road, which won't be easy. And as thrilling as Iowa's last two wins were, they were thisclose to blowing a game against Indiana that they controlled most of the way and they spent 36 minutes getting outplayed by Northwestern on Sunday before COMEBACK MODE kicked in. I don't think it's impossible that 14-6 or 13-7 could be good enough for fourth place in the league, but if that's Iowa's record, they'll need help from the other teams playing Maryland and Wisconsin. At 8-5 Iowa has already doubled their Big Ten win total from last season. They've very likely guaranteed that they won't have to play on Wednesday at the Big Ten Tournament. But getting a top-four finish -- and a double-bye to Friday -- looks very challenging. That said, the odds on a top-four finish looked even longer a few weeks ago. If Iowa keeps winning and teams ahead of them have a few hiccups, the beginning of March could get even more interesting for Hawkeye hoops.